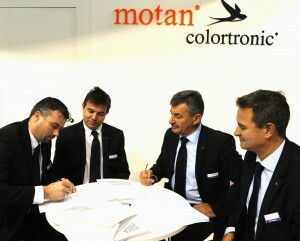 During the K 2013 fair in Düsseldorf, motan-colortronic added a new subsidiary to the family – motan colortronic do Brasil LTDA in Piracicaba (São Paulo region). Contracts were signed by Beat Amrein and Jefferson F. S. Macedo (for motan-colortronic do Brasil), as well as Ulrich Eberhardt and Frank Medgyesy (for motan-colortronic AG). The new sales and service subsidiary is equipped with the most modern equipment and systems for direct support of the plastics market in the region. After good growth in the Brazilian market over the past several years, motan-colortronic customers can count on continued support in future by a strong sales and service team. The contract was signed on October 18th at the K 2013 on Stand B 24 in Hall 9, finalizing the formalities for establishing the motan-colortronic subsidiary in Brazil. Beat Amrein, Jefferson F. S. Macedo, Ulrich Eberhardt and Frank Medgyesy all agree, “high importance must be attached to this market in view of the strong growth potential. With this step, customers in the South American market will be reached quickly and directly. This fits in with the service strategy of the motan group”. With its new office, the ancillary equipment supplier motan-colortronic can offer its Brazilian customers application-orientated consultancy, faster project development and comprehensive customer service. “Up to now, our customers in Brazil and elsewhere in South America have been supported through sales partners and our other subsidiaries in Europe. With the new office in Piracicaba, our customers now have the advantages of a local subsidiary within an international network” says Managing Director Beat Amrein. The company offers innovative modular system solutions for storage, drying & crystallisation, conveying, dosing and mixing of raw materials for the plastics producing and processing industry. This system complies with continually rising quality demands of the South American market. “motan-colortronic ensures that tailor-made solutions are made available for the respective process conditions which have a sustainable influence on final product quality, productivity and efficiency”, stresses Carl Litherland, Vice President Marketing at motan holding gmbh in Constance, Germany.